Please join us in congratulating the Oregon Nurseries Foundation’s 2018-19 Scholarship Award Winners. Students were evaluated based on academic achievement, nursery industry commitment and financial need. Scholarships are applied for during winter term and awarded by the ONF’s committee each spring. The next cycle will open in January. Applications are due March 31, 2019. Ann Amato is, in her own words, a nontraditional student. She has a lengthy background in various aspects of horticulture, from an active garden blogger to running an online seed company to working in the propagation department at Cistus Nursery. Ann will be a freshman at Clackamas Community College this fall to continue her education with the hopes of working in breeding, preservation, education and even management within the horticulture industry. She was awarded the Nursery Employee Award. Tyler Beasley is continuing his education at Oregon State University’s Ecampus and will be a senior working towards his degree in horticulture. 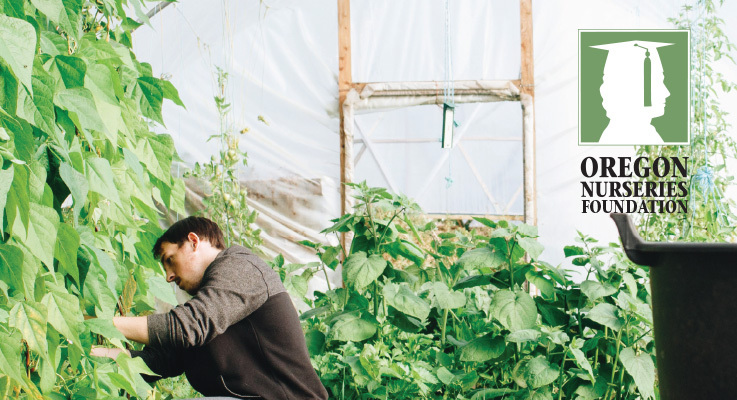 In addition, Tyler works full-time as the greenhouse manager for Spokane Community College. Tyler was awarded both Mt. Hood Chapter Awards, I and II, which will assist him in achieving his goal of working on hybridized ornamental plants and plant breeding while supporting his family financially as well. Helene Dondero is an agriculture science major at California Polytechnic State University, San Luis Obispo. Helene has grown up being exposed to the horticulture industry through involvement with her mother’s flower shop and local growers. She has a long list of achievements and activities with the Linden FFA and Cal Poly CFFA chapters. She also serves as the Cal Poly Ag Ambassador. Helene was awarded the Larry Fitzgerald Memorial Scholarship as she follows in her mother’s footsteps, also a Cal Poly alum and ornamental horticulture major. Samantha Emmsley will be entering college in the fall as a freshman at Oregon State University and was awarded the Clackamas Chapter Award. Samantha grew up on a farm in Hawaii and is the daughter of an agriculture professor at UH Maui College. Growing up around plants ­— harvesting, propagating, cultivating — Samantha has developed a passion for plants and plans to work in restoration and raise native plants for reforestation and landscaping. She also represented the Agricultural Community of Hawai’i at the National Conservation Awareness Land Judging Competition held in Oklahoma City in May 2018. Racine Haar is currently pursuing an associates degree in horticulture at Clackamas Community College with plans to transfer to Oregon State Unversity for a four-year degree. She was awarded the Retail Chapter II Award. Racine divides her time between school and working as the lead associate in the garden center at her local Fred Meyer. She will ultimately like a career in a large nursery or greenhouse that produces plants that will be used by state and local government entities. Emily Iverson will be a sophomore at Eastern Oregon University and was awarded the Retail Chapter I Award and the Sid and Cindy Miles Nursery Award. Emily grew up working on her family’s farm, Wooden Shoe Tulip Farm, and wants to continue the growth of the business with her completed education in agribusiness. Michael Kehoe is a senior at Portland Community College studying landscape design and environmental management. His ultimate goal is to have his own business, specializing in designing landscapes, gardens, and restoration projects that manage landscapes in sustainable ways. Michael was awarded the Bob Fessler Family Foundation/Woodburn Nursery I Award which will assist him in achieving his goal while continuing to support his growing family financially as well. Saralun Ondee will be an incoming freshman this fall at Clackamas Community College. Saralun participated in CREST (Center for Research in Environmental Sciences and Technologies) as a farm intern and progressed to being hired as a farm intern leader and is passionate about sustainable farming. She has been awarded the Bob Fessler Family Foundation/Woodburn Nursery II Award to help finance her interest in horticultural education. Janae Patino transferred to Oregon State University after earning a master’s degree at California State University, Los Angeles. Janae also received her Master Gardener certification and works as a garden educator at the Harlem Children’s Zone in New York. She has been awarded the Royal Boltman Award and Bill Egan Memorial Award. Janae is particularly interested in working in greenhouse and ornamental horticulture while continuing to educate people about growing their own plants for enjoyment and for food. Ricardo Luna Rendon will be an incoming freshman at Clackamas Community College this fall. Ricardo has grown up in the industry, having followed his father as a child to the nursery where he worked to now helping manage an entire nursery. Ricky has benefited from hands on training in all aspects of running a nursery and has the support of his employer to supplement this training with an education in Horticulture. He has been awarded the Joseph H. Klupenger Award. Jimmy Reyes is returning to Chemeketa Community College as a sophomore this fall. He is actively involved in his family’s business, Palmer Creek Nursery, with the eventual goal of taking over as the next generation owner. Jimmy is pursuing a degree in horticulture business management and was awarded the Willamette Chapter Award. He is active with the Dayton FFA and has won many awards including first in National FFA Proficiency in Diversified Horticulture in 2018. Ellen Selander has been awarded the Emerald Empire Chapter Award and the Nurseries Foundation Award for her senior year at Oregon State University. Ellen transferred from Chemeketa Community College and is pursuing a degree in horticulture. She currently works at OSU’s Plant Clinic as a lab technician. Her particular interest in agriculture lies in organic vegetable and fruit production as well as heirloom seed saving and collecting. Sidney Shelton will be a sophomore at Clackamas Community College in the fall and is pursuing a career in horticulture. Currently, Sidney is the plant and live goods manager at her local Ace Hardware and has the ability to work with local farms. She is passionate about the environment and hopes to own a nursery with greenhouses and a flower shop. Sidney was awarded the Retail Chapter III Award. Eric van Klaveren will be a sophomore at Oregon State University and has been awarded the Clackamas Chapter Ed Wood Memorial Award. Eric has been involved in the family business, Van’s Nursery, from a young age. He is working towards his business degree, with a minor in horticulture. His goal is to combine his education and work experience to own and operate a nursery, hazelnut farm, or landscaping company. The Oregon Association of Nurseries and the Oregon Nurseries Foundation congratulate each of these students on their impressive accomplishments thus far and wish them the best of luck as they continue towards building the future of a strong nursery industry.